Teddy Chan is one of the filmmakers from Hong Kong I'm keeping an eye on. His last few films, namely "Body Guards and Assassins" (2009) and "Wait Till You're Older" (2005), were good films, and vastly different films. They were also released 4 years apart. Now, 5 years later, he's back with Donnie Yen, one of the biggest names in the martial arts genre, for a modern take on the classic martial arts film. Yen is perhaps first a martial artist, and second an actor. He just also happens to have one of the most recognizable faces in Hong Kong cinema. Here he also serves as martial arts director, while Teddy Chan is credited as the writer and director of the film. Yen plays Hahou Mo, a martial arts master who was imprisoned after turning himself in for killing someone he had been sparring with. Now, 3 years later, there has been a series of murders of martial artists that he knew. From prison, he sees a report on the news and demands to speak to the detective responsible for investigating the murders. She's Detective Luk Yuen-Sum (Charlie Yeung), a strong willed detective on the verge of losing charge of the case if she doesn't apprehend the suspect before his killing spree continues. Hahou is released from prison to help the police with the investigation when he's able to convince Detective Luk that she needs his help by predicting the next murder. The killer is known to leave a trademark thereby identifying himself as the killer of each particular victim. This small metallic trademark is known as an "Eaves Sparrow," which is later described as a practice from the Qing dynasty. The minister of war would give these sparrows as consolation prizes to the losers who partook in martial arts competitions. They were however seen as embarrassments considering they were a symbol of failure and lacking skill. He explains that the killer, Fung Yu-Sau (Baoqiang Wang), is a martial artist seeking to be known as the number one martial artist in Hong Kong. Hahou is able to predict the next victim because the pattern the killer follows is based on a martial arts practice, starting with fists then legs, grappling, weapons and internal energy. Each of his victims so far had been friends of Hahou, and masters of one of these disciplines. As the plot thickens we come to understand that Hahou was the leader of a school of martial arts, but wanted to prove himself and his school as the best. However, he accidentally lost control while fighting with a man from another school ending in the man's death. This mistake and the ensuing years of jail time away from his wife and school have taught him a painful lesson in humility. However, Yu-Sau, taking what Hahou did as inspiration, intends to battle his way to the top, as evidenced by his personal motto, "martial arts are for killing." As thin as it may seem, his ambition to be number one is the stuff of classic martial arts cinema. There is, however, a bit more backstory to the villain here. He became a powerful martial artist through his will to push himself to overcome his handicap. He was born with one leg longer than the other, and one leg far weaker than the other. He was also married to a woman dying of cancer, and while the film devotes a number of scenes to their relationship, this sad subplot isn't allowed to matter in any significant way. Baoqiang Wang gives an earnest performance as the villainous Fung Yu-Sau, even if it's at times melodramatic. To prove himself the best, he has to take down a list of the best names in martial arts, which includes Hahou. However, to ensure that Hahou is determined to fight to the death, Yu-Sau taunts him repeatedly during the investigation, with threats against his wife. Hahou and Detective Luk attempt to stay a step ahead of Yu-Sau which allows for some tense moments and intrigue. However, the more we learn about Hahou and Yu-Sau the more concerned the police become about his involvement. The story is about as classic martial arts film as it gets. Teddy Chan (who also wrote the original story) tries to breath some fresh air into things by setting it in modern day and introducing a number of interesting subplots, but sadly none of them go anywhere. However, for a script that sounds a bit shallow, Chan does inject some suspenseful twists and turns. He also manages to keep things moving at a brisk pace and the aforementioned twists do enough to keep us invested till the end as details surface between the hero and the villain. It isn't supposed to be high art, but then again few martial arts films are. If you're interested in watching a film from this genre, there's one thing you really need in order to enjoy it, and that's spectacular fight sequences. While it isn't free of over-the-top action, including some poor CGI backgrounds, it is otherwise a visual treat. The action isn't as brutal as something like the two "Raid" films, but it's well choreographed, particularly a later fight sequence that takes place on a busy motorway. Teddy Chan and martial arts director Donnie Yen have conjured up a film worthy of being placed alongside the classic Hong Kong martial arts films that inspired it. 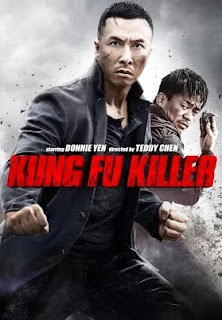 "Kung Fu Killer" is an exciting, action packed piece of popcorn fare that pays tribute to these famous film ancestors. From the many TV screens visible in the film showing classic martial arts films, to the classic Chinese musical accompaniment, to the closing credits featuring a lengthy dedication thanking the many people who have contributed to the genre over the years. Many of these faces also had a role in the film either as an on screen cameo or while working behind the scenes. This dedication is a reminder of the strong tradition of the martial arts genre in Hong Kong. Furthermore, there is an obvious love of the city where so many of these action films have originated. It's shown in numerous establishing shots, many of which are breathtaking timelapses that show the city's wide ranging beauty, from its mountainous vistas, to its ocean shorelines and the jungle of tall towers in between. There is a sense of artistry to these films from the choreography, to the visuals, to the appreciation of Chinese martial arts history. Chan and Yen ensured that "Kung Fu Killer" was packed with these things from open to close.